Change is the only constant, long ago, said a wise human. When everything around us keeps changing, does it change for better? Always? There is a certain set of such questions that need an answer, on an immediate basis, but who cares? How do we define change? Sadly, anything that affects us at the personal level only. No matter what is happening out there in the world, we wait to take rather initiate an action unless it affects us. The entire process of going through a change is very subjective and hard to accept if it asks to break with routine. A change, at first, looks impossible, but when it is about progress the end has to be bright and delightful. I recently read Ink Echoes a poetry book by author Pinaki Kotecha, who is a Marketer by profession and lover of words at heart. 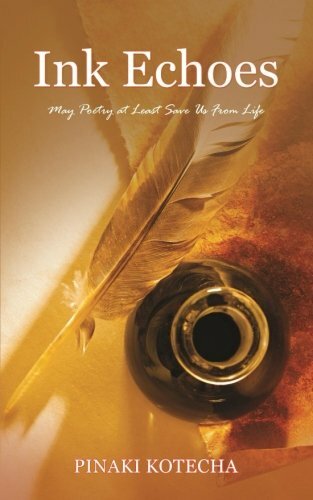 Ink Echoes is a collection of poems on various facets of life across diversified topics and the tagline of the book is "May poetry at least save us from life" and according to Pinaki Kotecha her book Ink Echoes is a creation of coming together of several feelings as an attempt to voice something. The poems of Ink Echoes are nothing less than the reflection of the community we live in, the evils, the goods, the hopes, the love, the expectations and you may relate to them in one way or the other. There are assorted emotions spread across the thirty poems of Ink Echoes which are critically thought provoking and are expansive without being conclusive, allowing you to rekindle your hope. The poem "On Problems" talks about the problems that we often notice, not necessarily go through, and only wonder about the life being led by the one suffering only by doing nothing about it. One of the lines from this poem says, "Peer Pressure and anxiety crop from society, No brand new stuff, don't the rag pickers have variety?". Similarly, all the poems have great depth and accelerate quickly with hope. Some of my favorite poems from Ink Echoes by Pinaki Kotecha were A Jinxed Verse, Miracle Of Life, Try Again, Deluge, There Is A Way, Sinking Within and Parts Of Speech. I would recommend this book to everyone who loves poetry and life!